« Our Home of Thirty-three years! 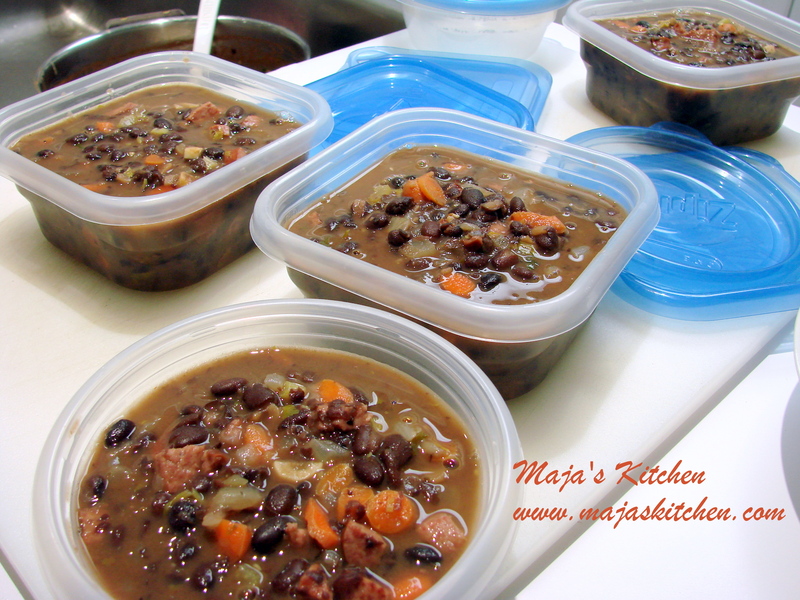 Maja’s Kitchen Newsletter ………..January, 2015 ! Winter is “Soup Time” in Maja’s Kitchen, therefore, I want to start my Blog Post for the New Year with my very first soup for this year. 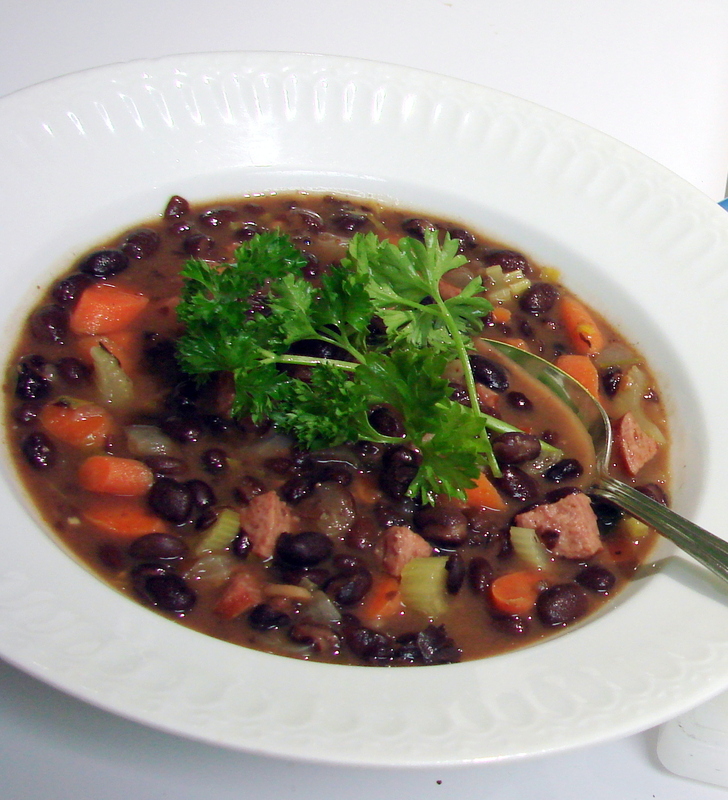 It is the Black Bean Soup that everyone loved when it was on the menu in one of my cooking classes. The soup is easy to make and it takes hardly any time at all to prepare. You do not need a crock pot, just a regular soup pot and a few ingredients to make it. I love these kind of recipes when I can bring everything together on my counter, chop the vegetables, wash the beans after they come out of the can, add the spices and the rest of the ingredients and place them into the waiting pot on the stove. When all the ingredients are in the soup pot turn on the heat, and let it all boil up for a few minutes and the soup is ready in half an hour or less. Serve it with some toasted, buttered bread and dinner is done! I love a small cup of apple sauce after the meal to cleanse my palate. 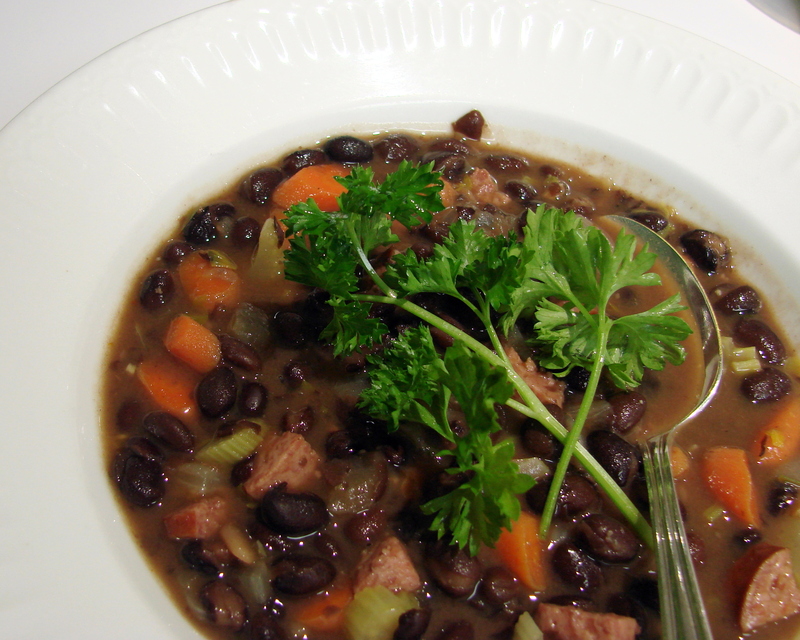 By the way…..make a double recipe……because this soup is great to keep in the freezer for another meals later on. Cleaning up the kitchen is quickly done as well …and you can relax with a book on the couch….or…. with a favorite TV Show…. Makes about 6 to 8 servings! Rinse the beans with warm water before you continue with the recipe. 1 large onion – diced and caramelized in a little olive oil. 4-6 cups Chicken Stock – or less, depending on the amount of soup you want. 1lb Polish Sausage – cooked and diced. Garnish with sour cream and 5 or 6 chopped green onions or parsley. Add sauteed onions, celery, carrot, garlic and tomato paste. Cook until vegetables are just tender. Add cooked Polish Sausage and serve with sour cream and green onions. and smash the beans with a potato masher. Return the smashed beans to the pot to thicken the soup. Add the Spuds to the pot and bring it up to a quick boil for about a minute. until it has the thickness you like. This recipe can be doubled or quadrupled. Lots of love to you and Bob…. Thanks – looks like a good bean soup. Great – Maja’s kitchen is up and cooking again! A hearty, warm soup is just what we need in this bone chilling cold. Hi Karin…thank you for your nice note….always love hearing from you…. About the Sugarprincess….I looked through her website…and really love what she does…but all her guests enter German posts….my German fails when it comes to technical expressions in the recipes…therefore, I do not know if she would accept my cake blog posts…Maybe I need to write her…?? Big hug to you….and am glad you are not ankle deep in snow this time around….